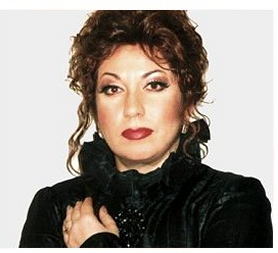 Elena Zelenskaya is a leading soprano with the Bolshoi Theatre where she made her debut in the title role of TOSCA. A competition winner, she graduated from the Baku Conservatoire and on winning first prize at the Rimsky-Korsakov International Competition in St. Petersburg joined the Moscow New Opera Company before going on to the Bolshoi Her international career began at the Mozart in Schönbrunn Festival in Vienna where she sang both Elvira DON GIOVANNI and La Contessa LE NOZZE DI FIGARO. Since then she has sung with important theatres throughout the world, including the Metropolitan Opera, Opéra Bastille, the Deutsche Oper Berlin, the Royal Danish Opera, Théâtre Royal de la Monnaie and in many festivals. BEETHOVEN SYMPHONY NO. 9; BRITTEN WAR REQUIEM: RACHMANINOV THE BELLS; ROSSINI STABAT MATER; VERDI MESSA DA REQUIEM and a full repertoire of GLINKA, RACHMANINOV, TCHAIKOVSKY and MAHLER. VERDI MESSA DA REQUIEM at The Royal Albert Hall cond. Georg Solti; in San Diego and in Lubliana. BRITTEN WAR REQUIEM with Los Angeles Phlharmonic cond. Antonio Pappano. RACHMANINOV - THE BELLS in Madrid. SHOSTAKOVICH SEVEN ROMANCES ON POEMS OF ALEXANDER BLOK - OP. 127 ~ with the Musicians of Opéra National de Paris at the Palais Garnier. CONCERT IN HONOUR OF PRESIDENT PUTIN to celebrate the one hundred and fiftieth anniversary of the Alexandrinsky Theatre in St. Petersburg. MAHLERS SYMPHONY NO. 2 with the Tampere Philharmonic Orchestra. Role debut as TURANDOT at the Bolshoi and at the Bremen Waterfront. AIDA in Gozo (Malta); returned to the Melbourne Symphony Orchestra for the Britten War Requiem and sang Le Villi and Cavalleria Rusticana for Opera Bergen.